As I've grown a bit older, I've had the pleasure of rediscovering the joy of a good board game. Game night is now one of the most cherished nights my significant other and I have around these parts, replacing beer pong, ring of fire, and other such flights of fancy. And it's with this newly rediscovered love of games played on boards that we wanted to pass along word that a new series of classic games are coming back later this year, this time however they will be themed around Stephen King's IT and that loveable old scamp Pennywise. 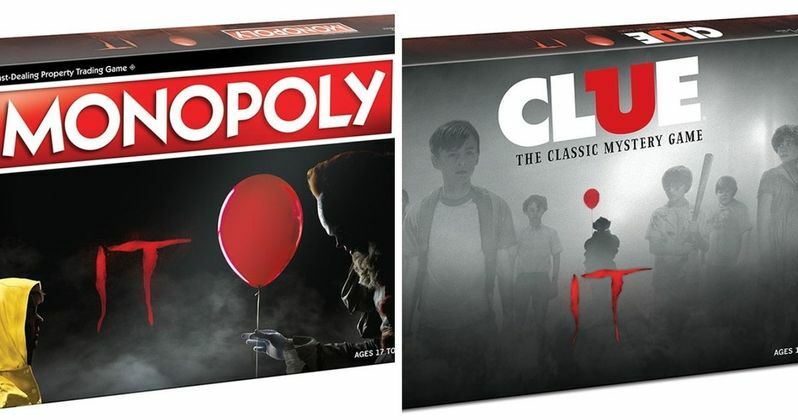 Yes, as you can see from the pics below, Monopoly: IT, and Clue: IT are crawling out the sewers and into your game room this year. Created in partnership with Warner Bros. Consumer Products and based on the hit 2017 Warner Bros. Pictures' film, CLUE: IT takes the classic mystery game even further into shrouded chaos as Bill Denbrough and his friends attempt to determine Pennywise's Plan. Travel between The House on Neibolt Street, the Synagogue, Derry Public Library, and more to identify various items used to lure the town's youth, while avoiding Red Balloons that will end the operation before the menacing killer's Plan can be uncovered. CLUE: IT will be available this March. Also inspired by the highly-acclaimed film, MONOPOLY: IT makes buying, selling, and trading places in and around Derry, Maine the key to winning this uncanny twist of "The Landlord's Game." Using tokens of iconic items such as an Inhaler, Paper Boat, and Bicycle, players can draw Encounters and Phenomena cards as they build Suburban Houses and Apartment Buildings on locations like Pennywise's Cistern and the Derry Sewers. MONOPOLY: IT will be available later this year. And if both of those killer new editions to your game room weren't enough, The Op will also be unleashing the first-ever signature game based on the horror franchise. This new game is called IT: EVIL BELOW and it's a cooperative dice and card game that challenges all members of The Loser's Club to work together to drive Pennywise back into hibernation. More information about IT: Evil Below will be announced later this year! Until then remember that director Andy Muschietti's upcoming sequel to his hit adaptation of Stephen King's IT is heading our way this September. Written by Gary Dauberman, IT: Chapter 2 is easily one of the most anticipated horror movies of all-time. This time around, the kid cast had been replaced with adults such as Bill Hader, James McAvoy, Jessica Chastain, Jay Ryan, Isaiah Mustafa, James Ransone, and Andy Bean. But no worries, the original films cast has been confirmed to return as well with Jaeden Lieberher as Bill Denbrough, Sophia Lillis as Beverly Marsh, Jeremy Ray Taylor as Ben Hanscom, Chosen Jacobs as Mike Hanlon, Jack Dylan Grazer as Eddie Kaspbrak, and Wyatt Oleff as Stanley Uris. And let's not forget Bill Skarsgård as It / Pennywise the Dancing Clown. IT: Chapter Two creeps and crawls into theaters on September 6, 2019. This killer news was originally shared over at The OP.